I love a salad that has a lot going on in it... Fresh salad leaves coated in a red wine vinegar dressing, accompanied by warm, crispy bacon and hot melting brie straight from the oven. Throw in a handful of juicy grapes and the result is a salad that can hold it's own against the meatiest of main courses. Before you start have all the ingredients weighed out and ready. Preheat your oven to 190c. Have your food processor out and plugged in and click here! Preheat your oven to 200c. 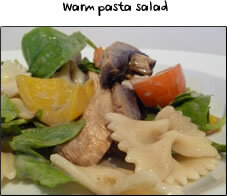 Put the salad leaves in a large mixing bowl and put the pan/wok on the hob on a high heat to get nicely hot. Slice the brie into approximately 1cm thick slices (this should make about 5 slices). Place these on your lined baking tray. By now your pan should be getting nice and hot so pour about a teaspoon of oil into the pan and add the bacon lardons. Pop the baking tray in the oven and cook both the bacon and brie for 5 minutes, stirring the bacon occasionally. 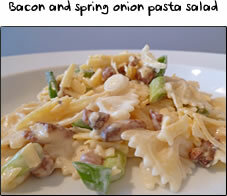 Whilst the bacon and brie are cooking you can make the dressing. Add 1 tablespoon of extra virgin olive oil to your little bowl or jar, together with 1 teaspoon of red wine vinegar and a small pinch of salt & pepper. Shake or whisk together then pour over the salad in the mixing bowl. 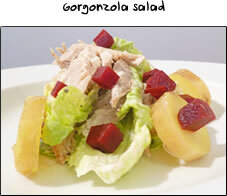 Using your hands, lightly toss the salad so that all the leaves are coated and shiny. By now the bacon and brie should be done so turn the hob off and remove the brie from the oven. The brie should be melted but not obliterated. 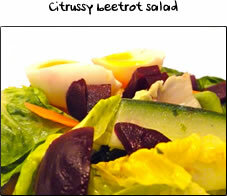 To assemble each salad, take a handful of salad leaves and place in the centre of a plate or bowl. Scatter crispy bacon lardons and grapes over the leaves. Using a palate or butter knife, scrape melted slices of brie from the baking tray and place on top and you're done!